I think this is a good bit of advice for any new writer. 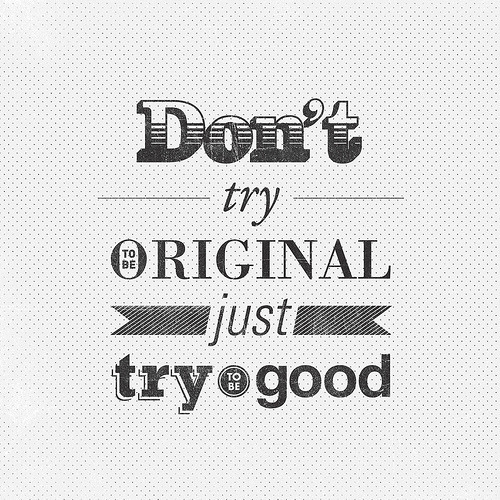 Now don’t get me wrong, being original is great, important even. But focusing on being original is not the way to be original. Instead, I think the best thing a new writer can do is focus on being a good writer. Focus on craft. Focus on the technical aspects of writing rather than the next Big Thing. Because if you do come up with the idea of the century, you want to be a good enough writer to write it, don’t you? Of course I remember you both! I love that realization. So often I stumble across stories that are basically the same idea but because the writer had a voice and put their own hard work into it, they were both amazing. Besides, good artists copy and great artists steal right?